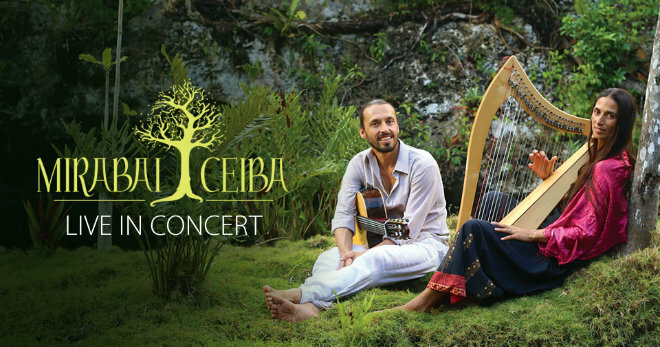 “Mirabai Ceiba, Live in Concert”, their stunning new album, brings you straight into their audiences of thousands as they bring their signature mix of angelic mantra, sensual vocals, and a gentle blend of harp, guitar, and piano. Recorded live in sacred chant concerts from Estonia to Joshua Tree to Mexico City, this haunting album brings the listeners straight into a sound cocoon of deep healing, of joyful rejuvenation, and vibrant emotional power. Premium Tickets: $40 advance; $50 door (first four rows) SOLD OUT!